Home » george lucas , prequels , star wars » Are the Star Wars prequels better than the original trilogy? Are the Star Wars prequels better than the original trilogy? A few days ago Timothy Sexton authored this intriguing - and no doubt controversial - essay in which he argues that the "prequel trilogy" of the Star Wars saga is better than the three originals which George Lucas produced between 1977 and 1983. It is Sexton's contention that Episodes I, II and III "are deeper, better structured, and more politically astute than the final three. Not only is that why the prequel is superior, it is also a pretty decent elucidation of the original trilogy's greater popularity." I have to concede however, that Sexton is making a lot of good points here. Particularly about how the prequel trilogy is increasingly relevant in light of the culture of our time. 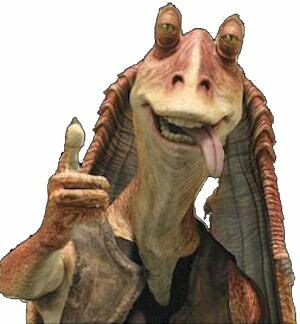 And I'm feeling compelled and ready enough to offer up my own theory about the prequels. Here's what I think really happened: once upon a time, there really were going to be nine or even twelve Star Wars films. In retrospect I think that twelve would have been too many, but a "trilogy of trilogies" sounds better, and has a nice operatic ring to it. Following The Empire Strikes Back in 1980, I do indeed believe that that was the plan. But one thing happened which threw those plans into turmoil: Marcia Lucas left George. Look folks, I know what kind of a blow a divorce can deal. I've experienced it firsthand. It's something that you wouldn't wish for anyone to have to go through. Three years later and I'm only now beginning to be able to really pick up the pieces and move forward, hopefully toward bigger and better things that God might have in store. More than anything else, divorce crippled me creatively. I'm working on two new film projects now, the first in a long time. But even with smaller gigs like that, it has been a massive struggle. I can only begin to imagine what kind of a blow that was to George Lucas: a man who not only has been creative his entire life, but has built a multi-billion dollar empire upon it... along with all the responsibilities of creating industries employing hundreds, if not thousands of people. Many people argue that Return of the Jedi was the weakest installment of the original Star Wars trilogy. If it was, considering what George Lucas was going through in his personal life at the time, then we should be thankful that Return of the Jedi came out as good as it did. Personally, I think it's a powerful and fitting conclusion to the saga... but had Lucas not been hit hard with the divorce, I would bet good money that there would have been an Episodes VII, VIII and IX. Eventually. So how does this relate to what we got with the prequels? It was almost a dozen years after Return of the Jedi before George Lucas sat down to work in his office to begin writing Episode I. And during that span of time two other things happened in his life. The first is that he became older, wiser as a person. The second is that he became an adoptive father. He now has three children. When a man becomes a father, however that comes about, his thoughts begin to turn toward "What kind of a world am I leaving my children?" It's not a far hop at all from that to "What kind of a world am I going to leave behind, at all?" Lucas' love of history is well documented. The dude gets the meaning of works like Gibbon's The History of the Decline and Fall of the Roman Empire. In the lead-up to Episode III Lucas was quoted a lot for remarking that "all democracies eventually become tyrannies". And that is what drove the prequels to become... what they are. A cautionary tale about decadence and corruption. A warning, against the folly of forsaking wisdom and patience for power and control. A tragic morality play about how even those things with the best of intentions can and will fall because of all-too-human frailties. It takes the better part of two whole movies to set the board for that, but by the time Episode III comes around, there is no denying that the creator of Star Wars... has a message, for all children as much as for his own. Think I'm wrong? Well, stop for a moment and think back to all the times in the past number of years that Padme's line has been quoted: "So this is how liberty dies: with thunderous applause." I've seen that line used in more than a few places just during the last few weeks, in regard to any number of matters. I don't think that George Lucas sold out or "got lazy" or anything like that so far as the prequels go. He simply made the Star Wars movies that he, being the best of the person that he could have been at the time, felt led to make. Three movies intended to give pause and consideration as much as they were meant to entertain. In the end, the prequels are a product of the evolution and growth of their creator as a person. I don't know if he could have tried to channel "the old George" for sake of his audience... and I honestly don't know if anyone had or has the right to expect that of him. Or to expect that of any person, for that matter. I don't disagree with the article, but just wish the execution of the interesting ideas of the prequel had been better. I can't get past the bad directing of good actors, the hacky things done for cheap laughs, and the bloated scenes filled with people sitting and talking. And ultimately, the article made me sad to think about what could have been.